Good afternoon! It's my turn this week to share my card using a fun Mo's Digital Pencil image and today I have colored up the beautiful, Naunet! I have used an old Prima paper pad, Alla Prima. The flowers are Wild Orchid Crafts as well as the strung pearls. The pearls I bought a while back and didn't know what to do with them until this card. They reminded me of bubbles, which I thought was perfect for my tropical mermaid! I dyed some seam binding with Distress Ink Evergreen Bough. I muted the Yellow Orange flowers with gesso and I think I would've been happier with an extra layer. My Martha Stewart punch around the page for my shell border. I usually like more muted colors but I think the bright colors suit Naunet perfectly! Thanks for stopping by! 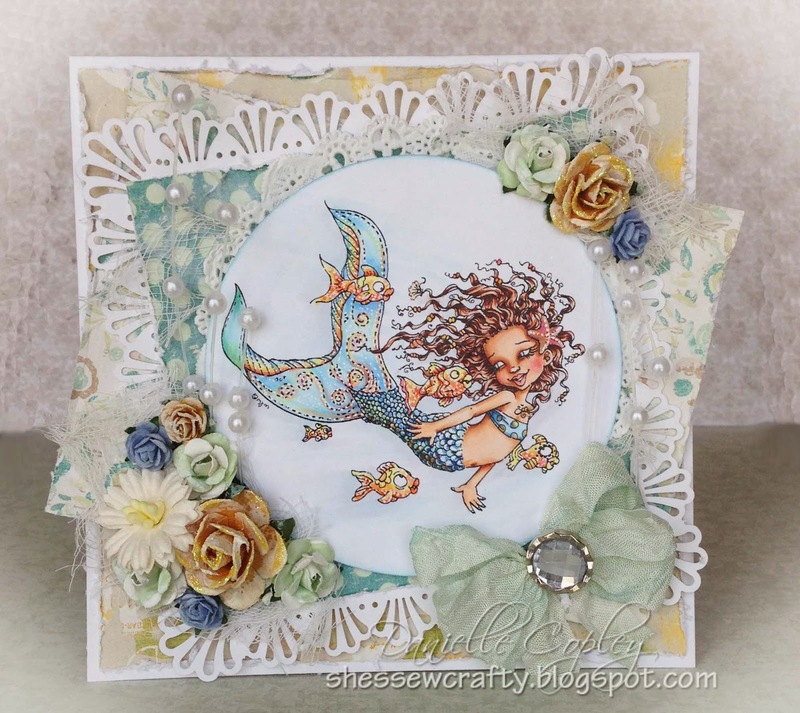 Stunning card Danielle, the embellishments work wonderfully with Mo's new image, I love it. Wow, love your card! Gorgeous layers, colours, image, flowers......love it all! Have a lovely weekend! p.s I have candy if you'd like to enter! Love your card. I just bought that digi today. Oooh, I lurve your version of her!! I saw her on May 4th, coloured by someone else on M.D.T. This has got SO much to look at, as per usual. Thaks! I will have to go and check out the other version now!, LOL! Beautiful! That shell border is perfect, and your colouring is wonderful!